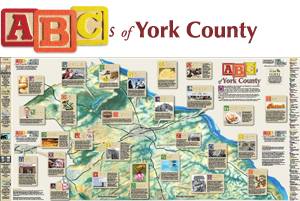 The ABCs of York County series started as an experiment on this blog. In late 2009. I’d noticed that when I posted about the county’s icons – you know, like our potato-chip makers? – I’d get tons of reader comments. So, I wondered, is there a way to identify just what those icons are? I turned the question over to the blog’s readers and figured out a plan – we’d work our way through the alphabet and use polling – admittedly unscientific – to determine a “winner” for each letter. I started by taking suggestions for the best “A” of York County for a week. Then, I posted those suggestions as poll choices and allowed readers a week to cast their votes and to make their “B” nominations. The following week, I announced the “A” winner, kicked off the “B” voting, and started taking “C” suggestions. And off we went, following that format through the alphabet. Some letters were a little hard to get nominations for. Some of the results were surprising. But, by the time we wrapped up this summer, I realized we’d created a pretty good list of the things that make York County great. Here are the winners, so you can see for yourself. Agree? Disagree? Leave comments with your thoughts!